Anti-aging formula for all skin types. Place your usual skincare serum or cream into the palm of your hand and add 1 to 2 drops of Customizable Concentrate. Mix with fingertips. Apply to clean face, avoiding direct contact with eyes. Sepilift DPHP is a trademark of Seppic. Ingredients: Water (Aqua/Eau), Sesamum Indicum (Sesame) Seed Oil, Butylene Glycol, Isononyl Isononanoate, Pentylene Glycol, Glycerin, Cyclopentasiloxane, Mica, Dipalmitoyl Hydroxyproline, Hydroxyethyl Acrylate/Sodium Acryloyldimethyl Taurate Copolymer, Dimethicone, Isohexadecane, Zingiber Cassumunar Root Oil, Xanthan Gum, Polysorbate 60, Sodium Hydroxide, Phenoxyethanol, Ethylhexylglycerin, Fragrance (Parfum), Amyl Cinnamal, Benzyl Salicylate, Citronellol, Hexyl Cinnamal, Butylphenyl Methylpropional, Limonene, Alpha-Isomethyl Ionone, Titanium Dioxide (CI 77891), Ext. Violet 2 (CI 60730), Blue 1 (CI 42090). Great compliment to face and neck cream. This product is added to your face and neck cream and provides extra firmness without being greasy or sticky. I liked it so much I ordered another. 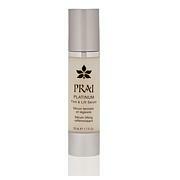 Ive had good results with all the Prai products Ive tried. 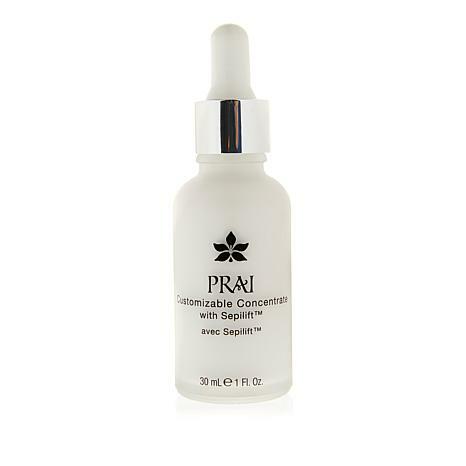 Have only been using this concentrate a short time, but believe it does make a difference for my aging skin. Love everything from Prai. I noticed a difference in my skin just after the first use. I have used for less than a week, and it is my favorite product. At first I mixed with a serum, but I went back and presentation again, and decided to try it alone, That was my wow moment, it is has a beautiful sheen plus I love the way it makes my skin feel and look. Love, love.